Last week Channel News Asia reported a bold architectural design for its new Learning Hub. It made me think about form and function in education and worship. The design had tutorial rooms that looked circular and were stacked up into towers. The design was stunning and eye-catching. More importantly it’s form was aligned to its function beautifully. “The seven-storey learning hub will house 55 new-generation classrooms of the future, designed to support new pedagogies by promoting more interactive small group teaching and active learning,” is how Professor Kam explained the design. The building suited the pedagogies that maximized learning. I liked it immediately. It was Winston Churchill who said, ‘We shape our buildings and afterwards our buildings shape us.” These NTU buildings will create a sense of community, like a family or clan gathered around a fire or a meal inside a circular shaped African hut or Mongolian yurt. The context of informality, collaboration and interaction will create a productive learning environment. The church building too should be an apt expression of its theology, worship, community and context. We have all kinds of church buildings in Singapore. The early church buildings in Singapore were forms imported from the west that gave token consideration to the Singaporean context, mainly its weather. Case in point is the oldest church building in Singapore: the Armenian Church consecrated in 1836. Most of the buildings in the 70s onward were pragmatic, space-maximizing utilitarian buildings built in the suburbs or in the HDB sites in the new housing estates. As land is scarce and expensive, maximizing usable space for various activities took priority over aesthetics. However I must say that the Catholics have done more justice in terms of constructing church buildings that aptly express their ideas of theology, worship, community and context much more than the Protestant churches. 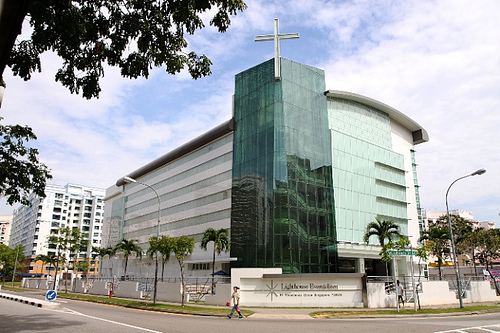 An example of this is St Mary of the Angels at Bukit Batok East, so beautiful it even won an architectural award. The church scene today resembles the income gap we see in most developing countries. With the rise of the mega-churches like City Harvest Church and New Creation Church we are seeing astronomical amounts being spent on facilities of spectacular scale and impact and mixed usage. This is partly due to the limits placed on the size of buildings that can be constructed on the HDB sites made available for bidding. They would be grossly inadequate for their regular meeting attendances of over 20,000. On the other, hand there are hundreds of churches, gatherings of God’s faithful in sizes of 50 to 300 members who meet in purchased or rented premises in unglamorous industrial buildings, commercial buildings, private schools, houses, cinemas, hotels and other such buildings. These are churches who have a sharper realization that the church is not a beautiful or spacious or practical building that houses God’s people, but a gathered people and community that houses God. They know they themselves are the dwelling place of God. It is in living out this revelation that we see form and function finally in embrace in the living entity called church. Before implying that the mega churches are meeting at “glamorous” venues because they lack the “sharper realization “, perhaps one should put himself in the shoes of the mega churches’ leadership and and seriously ponder over the reality of finding an “unglamorous ” venue for more than 20 thousand faithful to meet every Sunday. And yes, whether part of 30,50,300 or even 20,000 , every individual is still the faithful. Hi Stanley, small churches meet in unglamorous venues because of limited finances. It tends to help them feel more keenly that they are the church, the dwelling place of the Spirit. They find rest in that thought. Nothing is implied about mega-churches as they seek sustainable ways of keeping all the attendants together. I have written about in the past about the various options available for mega-churches besides keeping everyone together at such astronomical costs. No blame is intended, but merely a statement of opinion. I’m saddened when you say that small churches who gather in industrial buildings auto-magically “have a sharper realization that the church is not a building that houses God’s people but a gathered people and community that houses God”. And then worse, you somehow tie the situation to worldly issues like income-disparity as if somehow there is similar exploitation and injustice simply because some churches seem are more prosperous than others. Are you really suggesting that believers from those mega-churches place are generally unaware that the real church is the people and not simply a building? So you paint a community of believers one way simply by virtue of the fact that they happen to own a particular venue to hold gatherings? Anyway I can feel this article is going to stir up many of the same old religious shoot-from-the-hip comments decrying New Creation and City Harvest for spending millions on buildings instead of helping the poor etc etc. But I suggest we think through alternatives logically and rationally first. Practical things like how on earth do you house 25000+ believers every week in a large enough building when handling all the logistics like seating, safety, sound and video systems, lighting, music, security, transport, food, vehicle parking, props, ushering, pastoral services, sunday school etc etc etc, in space-scarce Singapore no less, while getting the best quality for the amount you can afford. Yes Ben there is that deliberately provocative slant in the post, though with no ill intent. Yes I have often thought and affirmed that the paths taken by CHC and NCC seem to be the best alternative if a mega-church wants to keep the members together. But do they need to keep them together? Multi-site churches are now increasingly the option taken by mega-churches in USA. We see a form of this in Victory Family Church in Singapore. Thanks for your comment. 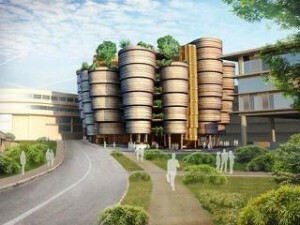 NCC is already multi Site… Rock Auditorium, GV Marina, MBS ballrooms… But this is also a problematic situation. For example, Rock Auditorium will be gone at the end of November because Suntec is a different development plan for the location. Months before that, NCC had to leave Suntec Gallery West because it is going to be redeveloped into a shopping mall. There is no stable location, and the church has to scramble for alternatives when the current venues are taken back by the landlords. Even when NCC moves to The Star PAC in December, satellite sites will have to be prepared soon because the church is still growing larger. When you suggested multi sites as an alternative, perhaps you should really imagine yourself as the Senior Pastor of a mega church and seriously think through in land scarce Singapore, with the property market heating up at such a quick pace, how you are going to find enough alternative sites to house 20k+ members and the costs and logistics involved. Its interesting that the popularity of NCC has outpaced its plans to house that burgeoning growth. Stanley, you are right in pointing to the problems churches face in Singapore with regards to facilities. Whether mega or micro, the problem is equally frustrating and challenging and costly. Its largely because of the geographical, political and multi-religious context we find ourselves in. Yep Stanley, the gospel message is the power of God unto salvation and transformation. Surprised that in the age of affordable pervasive connectivity we are still hung up on bricks, mortar, function and form. xtians sud be waking to crowd sourcing and virtual reality to develop relationships that are more intimate and intense – psychologically we can manage only up to a max of 50 intimate and maybe another 250 casual relationship . Whilst herding and crowding may satisfy some superficial affirmative social need of being “accepted” into a “secure” environ, at some point it is neither useful or beneficial. We are followers of a “Creator” God???? Hi Journeyman, you got me curious. In what practical ways can the church use “crowd sourcing'” and “virtual reality” as a means “to develop relationships that are more intimate and intense”? Pls define what u mean by “practical for a church” – easy to implement, maintain n update, low cost of acquisition, low total ownership, long lifecycle – all of the above as Chinese saying – good, cheap n ex stock? Easier if single attribute is desired gets progressively more difficult. Generally one need to define common interests whilst removing all vestable interest or art of having an acceptable vesting to provide the connecting media. Wiki is hitting this tipping point – control n direction – the GPL model of open source is best at moment. Maybe u can think abt what resources vs outcomes u desire – they r no experts just some more advanced practitioners and a lot of wannabes. I’m sure you don’t mean any offense at all. But because I (and many others I’m sure) am a fan of your blog and enjoy reading your articles very much, I was disappointed to see that you are actually promoting a small church vs large church comparison, as if one is somehow “holier” than the other solely because of the size of their bank accounts or the price of their buildings. Even though I might I have a soft spot too for the smaller churches in general, I still get annoyed by the automatic “rich = evil poor = good” carnal reactions from people, because, well, it’s just blatantly untrue. As for your argument about not keeping the community together, would it help to say that NCC (and I think CHC) is already doing this to some extent, because honestly it’s really the only viable option? For example, NCC currently has venues in Rock Audi, overflow rooms at Lvl 4 & 6, GV Marina, and the convention halls at MBS, as well as Shine Audi. When they move in to the new building, they would still have to keep satellite venues at MBS for example (not sure about others) because they still won’t all fit in one location. And keep in mind also that there are already four 2hr services held throughout the day. Yes Ben the small church vs large church issue does stir people’s feelings, doesn’t it? I am certainly not an enthusiastic fan of the mega-church and definitely cannot see myself being a member in one, but I can see why it is spiritually, economically and culturally appealing to many. There is a place for both in the modern spiritual landscape and though I am not envious of the mega-church I do feel a soft spot for the displacement and relegation of the small church to the lower leagues of kingdom life. Yes I must say that I enjoy reading your blog because it’s well-written, interesting and often quite informative. Many others probably feel the same way. But again it’s not fair when you say that people go to mega-churches because it’s “economically and culturally” appealing. I’m not sure what exactly you meant by that, but you seem to imply that people go to mega-churches just for the loud music, video screens, aircon and plush seating and to make friends with the rich, or basically any stupid and carnal reason except to hear about Jesus Christ and the word of God being preached. I can tell you that I attend one of these churches, and I can also tell you that I could not care less about where it’s located, whether it’s at a warehouse in Jurong or a palace in Timbuktu. I go because Jesus Christ is being preached there, and I seriously doubt that I’m unique in that way. Is it that surprising to you if I say that I want to hear more about Jesus? Unfortunately, coming from an “experienced” and “colorful” Christian background, I can also say that not many other churches large or small preach Jesus Christ like they do, so it’s not like I’m spoiled for choice if I want to hear something other than the same old man-centered motivational speeches. Blogpastor, I hope you attend in person and see for yourself how misplaced your prejudice can be. “but I can see why it is spiritually, economically and culturally appealing to many”. Hi Ben, let me elaborate: “spiritually” because of the preaching of the gospel and God’s word; “economically” because many mega-churches believe that God prospers His children inside and outside; and “culturally’ because our modern generation are more comfortable with a more contemporary touch in services and programs and location. Hope this clarifies. I really am quite disappointed with some of your views written her. You judge small churches as displaced, and relegated and lower in kingdom life. And then you pity them? This is prejudice, don’t you think? With an average attendance of around 25000, exactly how many multi-sites are expected? Based on your impression that a faithful church is based from the size of 50 members, NCC will need 500 sites EVERY SUNDAY just to share the message of Jesus. I think we don’t even have that many hotels in the entire Singapore. In olden days, a church size of 100 is considered average. In more recent times, probably a church size of 500 is considered average. Who is to say that in future, a church size of 25000 is considered average or big? Where is the basis your expectations of how many members is socially acceptable? Does this expectation come from the word of God or from yourself? love the insight, Pastor Kenny! Definition from wiki: Crowdsourcing is a process that involves outsourcing tasks to a distributed group of people. This process can occur both online and offline.The difference between crowdsourcing and ordinary outsourcing is that a task or problem is outsourced to an undefined public rather than a specific body, such as paid employees. Interesting comment when Wiki is actually a dynamic crowd sourced document……..
Wikipedia is written collaboratively by largely anonymous Internet volunteers who write without pay. Anyone with Internet access can write and make changes to Wikipedia articles, except in limited cases where editing is restricted to prevent disruption or vandalism. Users can contribute anonymously, under a pseudonym, or, if they choose to, with their real identity. Does crowd sourcing work – discern for yourself. “discern for yourself”… What a cop out! Obviously u r the knowledgable one – me just a average joe looking w a different perspective – u are obvious satisfied and comfortable with yours – attending a successful church is led by an anointed pastor and goes to mega size with uber prosperous constituents. My comment is not to provide u with an answer but to stimulate BlogpStor to have a different perspective and vision for a Xtain community. Perhaps your expectation of getting easy answers was the cop out – have always been stumbling and bumbling along an adventure. Maybe Zagat and Kickstarter would turn on some light for your curiosity. Encourage u to discern for yourself what might work for your own circumstances or perhaps this is bad suggestion on my part as utopia and paradise has been given to u provident Daddy God – mine has given me more questions than answers – Mine is about just about being grateful n enjoying the gift of being alive and exploring a wondrous world around me. 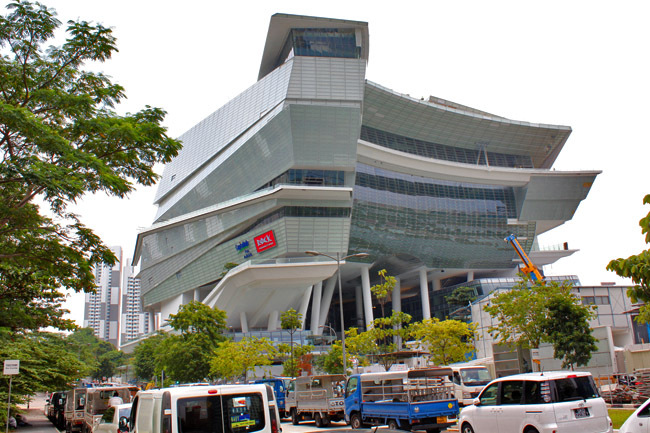 BTW über impressed by the lifestyle center your church partnered with Capitaland to develop – abit extravagant for my taste – but that is just my opinion of little consequence. Agree with blogpastor on the appealing part. Yes the full gospel must be preached esp the cost of discipleship. Salvation is free but discipleship has its cost and we are commanded to make disciples and not just converts. Religiosity aside, I’ll tell you what I frankly gave up when I took Jesus as my savior. I gave up my destructive habits for freedom. I gave up worry for hope. I gave up my stubborn self-reliance for His loving providence. I gave up my lack for His abundance. I gave up my stupidity for His wisdom. I gave up all my disqualifications for His qualifications. I gave up being careful for being carefree. I gave up being judgmental for being sympathetic. I gave up my wood for His gold. So what’s the cost??? Didn’t He say that His yoke is easy and His burden is light? Looking at all the real benefits of following Jesus, this is why I don’t understand why non-believers can remain non-believers, except that they have must have heard of a “religious” Jesus who places heavy burdens on them. You know, I can guess what’s the next thing most Christians reading this are going to do, that is to superficially interpret some Scripture verses that calls us to sell all our possessions and give to the poor to show the “cost” of discipleship without regard for proper context or intent to glorify Jesus and His finished work. There are members who take personal pride in being self-sacrificial by going to so called “unglamorous” places. There are (OBVIOUSLY MANY MORE in terms of actual numbers) members who go to a mega church because of their personal experience with God. Formula for a big church.. When Jesus heard what had happened, he withdrew by boat privately to a solitary place. Hearing of this, the crowds followed him on foot from the towns. 14When Jesus landed and saw a large crowd, he had compassion on them and healed their sick. 1. The large crowd followed Jesus. 2. Jesus had compassion on them. 3. Jesus healed their sick. 4. Jesus made the people sit down (rest). 6. The people were fed bread i.e. I am the bread of life. 7. The people ate fish i.e nourishment, prosperity.. ‘throw your net to the right side of the boat’. 8. They all ate and were satisfied. They came to church lame, blind, crippled, mute. They left church whole, healed, satisfied, prosperous, nourished and strengthened so that they do not ‘collapse on the way’. Praise the God of Israel. In cities where we cannot find churches willing to preach all these then yes, I look for plush seats, thick carpeting, good air conditioning, good parking spaces and great sound systems. Did Jesus Christ solicit for tithes/offerings to “build” His mega-church.? …….JC’s mega-church was an open field and the members/crowd sat on the grass. JC freely gave away food and healing to the members/crowd. How come present-day pastors of mega-churches do not follow the formula of the mega-church of JC, by freely giving away food and healing, not soliciting for tithes/offerings and making open fields as their mega-churches.? It’s funny but how come no one accused Moses of greed when he asked the Israelites for offerings to build the tabernacle and all the priestly vestments and all the furnishings in the Holy of Holies? All the Israelites, who were nomads then, still participated in the giving of their gold jewellery and even the sandals on their feet. So how come no accusations then? It’s funny but how come no one accused David of greed when he asked the congregation to give freely towards the building of the Temple? And they didn’t just give 1 cent each. It is said the people and David gave gold and precious stones, and they rejoiced in the giving. So how come no accusations then? And then now, when people tithe out of gratitude or offer to build a grander place for the gathering of the redeemed sons of God to worship and enjoy the Lord God their Father, people complain. And not just people, but also fellow believers! I think this is a strange and sad phenomenon. But anyway, forget about that for a moment. Just think about the practicalities and logistics of housing 25000+ believers every week in space-scarce Singapore, like it has been said many times before. If you can come up with a better plan then please let the relevant church know. Regarding giving away free food and healing, if you find any church that can multiply food and heal people as and when they feel like, let me know because I also want to go. Why r u bringing up OT stories about Moses and David soliciting for funds/tithes/offerings to build God’s Tabernacle and the Holy Temple of Jerusalem.? Lyn did not bring up OT stories about Moses and David to back up her claim that it is God’s will to have mega-churches and not small churches. …….She brought up the story of Jesus Christ at MATT.14:13-18 to back up her claim that it is God’s will to have mega-churches — as the “formula for a big church”. ….Since she brought up the story of JC as “the formula for a big church”, then it would be reasonable for me question her why the modern-day mega-churches do not follow this formula, ie like JC, their pastors should not solicit for tithes/offerings by passing money-bags around, should hold their services in open fields and should freely give away food and healings. In the Christian world, the concept of mega-churches was “invented” by the Pentecostals and Charismatics(neo-Pentecostals) in the last few decades. It is a modern invention or trend. I think the concept of mega-churches is retrogressive in Church development. It is going the way of the Kaaba in Mecca where millions of Muslims congregate during the Haj and the lost Holy Temple of Jerusalem(which was destroyed by God on 70AD – also MATT.27:51) where thousands of Jews congregated during annual Jewish Feasts(eg the Feast of Pentecost of ACTS.2). Seems like the concept of mega-churches is an effort by the flesh to re-establish the glorious days of King Solomon’s Holy Temple of God at Jerusalem, where thousands of Jews congregated. ….21 Jesus said to her, “Woman, believe Me, the hour is coming when you will neither on this mountain, nor in Jerusalem, worship the Father. ….22 You worship what you do not know; we know what we worship, for salvation is of the Jews. ….23 But the hour is coming, and now is, when the true worshipers will worship the Father in spirit and truth; for the Father is seeking such to worship Him. …. I have to ask but what in the world is a mega-church anyway? What is the definition of a mega-church? When a church has 1000 members? 5000 members? 20000 members? 20001? And mega-churches are all bad because… ? Such stupid labels and illogical biases we have sometimes. I really don’t understand why you make it sound bad but what is wrong about congregating in the thousands to worship Jesus anyway??? Maybe I get it. You like small 100 member churches because it feels homely or whatever. Perfectly fine. But don’t kid yourself that it’s because kilo-churches (yes I invented that word) are somehow Scriptural or “holier” just by virtue of being smaller. Because no mega pastor is a JC?? U r asking these pastors to be providents instead of being extractives – need a brand new mind set to do that and we r no where close! In my opinion if a pastor ‘solicit tithes / offerings’ to build a CHURCH, we’d better not question or get involvedlah. You don’t know who you’re criticising, God or the pastor. Because it might very well be God’s plan, you know. BUT, if a pastor is ‘soliciting tithes/ offerings’ to send their relatives overseas or to get out of a sticky situation then the congregation should question the wisdom of their generous offerings. However, even this is none of our business. JOHN.10:4-5 = “And when he brings out his own sheep, he goes before them; and the sheep follow him, for they know his voice. Lay church-members should not be dumb and blind sheep. They should heed only the voice and/or Word of God/JC. Salvation may be stolen if the sheep got conned by false pastors/shepherds(JOHN.10:10). God allows His people to question Him, like a son questioning his good father. Moses questioned God quite often. ….In fact, God has commanded His people to judge pastors/prophets by their fruits, ie the fruit of the Spirit(MATT.7:15-23, GAL.5:16-22) and to test the spirits of pastors/prophets by their spiritual confessions/words(1JOHN.4:1). I think many lay church-members/sheep hv the fear of questioning or doubting the words of their pastors, as if they r doubting God. They think that by doing so, they would anger God. Somehow, I think they hv acquired the spirit of fear that stops them from questioning or doubting the words of their pastors. (2TIM.1:7) God is love and He won’t mind His sheep questioning Him or questioning or doubting the pastors/prophets. ….True pastors/prophets will not mind being questioned and doubted by their lay church members/sheep and they will try their best to win the confidence of their sheep or pass their tests/judgement. Pastors/prophets who feel offended by such questioning and doubting are not true pastors/prophets. Doubting God and doubting pastors/prophets are 2 different matters bc a pastor is not the same as God. In the spirit world, the Holy Spirit and the Satanic/demonic spirit are competing for the attention of Mankind. This is similar to a customer entering a shop and being served by a salesperson. The customer has the right to question and doubt(double-check) the words of the salesperson. If the customer has done the due diligence and is finally satisfied with the information provided by the salesperson, the customer will buy the product, which will usually prove to be a good product. ….The customer should not be fearful to question and doubt the words of the salesperson. Such fear may cause the customer to buy a defective product. Such a customer who kept quiet feared raising the anger of the salesperson or feared making the salesperson “lose face”. ….In Churches(=shops), the members(=customer) want to “buy” salvation(=product) from the pastor(=salesperson). Spiritual wisdom from God is available to all believers if they make the effort to diligently study the Word of God or the Bible. ….Pastors know more about the Bible bc they went for 3-4 years of intense studies in Bible colleges. Their God-given job is to teach the lay church members/sheep who know less about the Bible(JOHN.21:17), eg teach about salvation and righteous living. The sheep should counter-check such pastoral teachings with the Bible or Word of God. ….A few Bible college educated pastors may stray from the true path of a true shepherd, eg tempted by the world of money, glamor, fame, grandeur, etc. Good sheep should not follow after false shepherds bc they often teach things that go against the Word of God/Bible. My policy when dealing with other Christians is to love. I may not always agree with them but I love and respect them all. We, being in the same family of God’s children. This gives me peace with God and with men. God deals with each of us in different ways. What some pastors testifies to may not be what speaks to us because of all that we have gone through in life and has seen with our eyes. Some people they don’t even want or like wealth because they are happy and fulfilled and what they value most are their families and friends, for example. They are just thankful for all that they have. So they work with the people around them and reach like people. Some people they want wealth to reach more people with their wealth and in the process they enjoy themselves too. I have been blessed by God in such a way so a church which preaches prosperity agrees with me. I cannot testify to any other circumstance. Some of us are looking forward to a ministry with poor people so an abundant life is not what we seek because we have a heart for the poor or sinners (a friend of mine has a heart for the lepers in China and another, saving ex-prostitutes). Having an abundant life will make them stick out like a sore thumb and awkward. Louis Vuitton handbags in the middle of the slums of India or Philippines, anyone? Some are running away from the law for the sake of the Gospel. Different pastors have different ministries, I say. God may have blessed some pastors financially and not others to reach different groups of people. Like, if the church is in the middle of Africa somewhere and the people are starving, preaching abundant life to them would be like a slap in the face, wouldn’t it? God is able but it’s just not going to flow that well. Or if the church is in the middle of a prosperous city somewhere (LA) and the pastor does not believe in prosperity, who would go? We all labour together for God and His people. Get more people in whatever it takes. In this way we fix our eyes on Jesus. We should ask God what our ministry is and then flow with it and own it. We are in no position to judge other Christians. Only God can. Praise God for you. Look at it from a wider perspective, in many places being a disciple means giving up relationships and even going into jail.We are very blessed in Spore. It scares me to hear someone think that non believers remain so because of heavy burdens impose by Jesus. It maybe true and untrue depending on the angle you are looking from.From a purely myopic view it maybe right. That’s why Jesus said narrow is the door. A great book which challenges us is “Not a Fan” by Kye Idleman and Rev Edmund Chan’s book on disciple making.Not a Fan challenges us to consider what it really means to be christian/discipe. Fan is an enthusiastic admirer but Jesus is not looking for fans.Everyone has their own story. We need to be balanced and lay out the full gospel. God bless. Actually, yes there’s one real cost that I forgot, which you reminded me of. That is, persecution by the world. But really, who cares about what the world can give compared to what God can give? If persecution comes, as Joseph Prince so aptly put, then shiok! It is just another seal of endorsement that I’m a true-blue born-again son in Christ. Careful what we wish for – even Peter faltered and I am not sure I wud be be different. Guess talk is cheap but walk requires His grace and our faith hope love. We will only know when the time comes. By the way just to be clearer, I think I do understand where you are coming from and I’m not belittling the fact that sometimes choices have to be made when we genuinely follow Jesus (ie, not-a-fan), but as I’ve tried to illustrate earlier, these so-called personal sacrifices aren’t really sacrifices anymore if we understand what Jesus is actually offering when He calls us to do something. I’m not trying to offend you in any way, I’m just not-a-fan of religious talk and I like to challenge these on whether they are actually based on God’s reality or man-made traditions. Most people for example are afraid that when you give your life to Jesus, He will immediately ask you to be a missionary in Timbuktu. Seriously. Personally, I believe that if He really calls me to be a missionary in Timbuktu, even if I’m initially hesitant, He will somehow make me want to go in the end. Didn’t He say that He works in me the will and the performance for His good pleasure? But He better supply me with lots of His favor because I know I’ll make a lousy missionary lol. highly glossed table where the patriarch was seated. Are some of the Singaporean. Practitioners that far behind? From the early beginnings of the Church, Satan has created much havoc, deception and disruption in the Church. Thru James the Righteous, the “biological” brother of Jesus Christ, who usurped the position of bishop of Jerusalem from apostle Peter, Satan was able to create havoc and false teachings in the early Church. James became a leader of a group of Jewish Christians called the Judaizers, who insisted that all new Gentile Christian converts must be circumcised and keep Moses Law. …….Paul, the apostle to the Gentiles, was totally against James and the Judaizers bc such a requirement would hv over-burdened the life of his Gentile converts with drastic changes – which might hv caused some of them to abandon their newly-born-again fragile faith. ….Thankfully, the Judaizers did not prevail and Paul was able to get nearly total exemption from Moses Law for his new Gentile converts. ….James was able to exact his revenge against Paul by getting him arrested by the Roman authorities when he visited Jerusalem. Paul was imprisoned in Rome and after a few years was executed by the Romans for not renouncing his faith. About 300 years later, Satan was able to “hijack” the whole Church thru the religious harlotry of the Roman Catholic Church(RCC) with the Roman Empire(REV.17 & 18), ie by currying favor with Emperor Constantine, the 1st Christian Roman Emperor. The bishop of Rome was able to install himself as the Supreme Bishop or Pope, ruling over the whole of Christiandom thru the political power and patronage of the Emperor; similar to how the Ayatollah rules Iran. It was the beginning of the “Dark Ages” of RCC tyranny and Inquisition when no dissent was tolerated, eg Galileo. In the 15th century, the RCC endorsed the imperialist and colonialist policies of the European Catholic kings, with the discovery of distant sea travel, eg Spain and Portugal. Colonialism dominated and tyrannized nearly the whole world, until the 20th century. Surprisingly, this was how the gospel reached every corner of the world. Somehow, God turned something evil into good. The Protestant Reformation of the 16th century heralded the beginning of the release of the Church from the shackles of RCC tyranny. This was caused by the political upheavals between the various European kingdoms. This religious liberation was aided also by the invention of the Printing Press when Bibles began to be widely distributed to the masses/common folks. Previously, only the RCC priests had Bibles. Notwithstanding the Protestant Reformation, Satan and his demons are still hard at work creating havoc, disruption and destruction in many Churches today, as per MATT.13:37-43 and JOHN.10:1-18. Today, the number of heretical and cultist ‘Churches’ is many; they hv been proven by the Bible/Word of God to be such. So, it is of paramount importance, for the sheep to not “buy” into the wrong Church and false teachings bc Satan is constantly trying to steal their salvation, kill their body and destroy the works of God/JC/HS. ….In this world and the Church, there are agents/prophets of God and there are also agents/prophets of Satan. The sheep have to distinguish properly whose voice they are hearing or reading. Are they hearing the voice/word of JC or the voice/word of Satan from these agents/prophets.? 12 For all who do these things are an abomination to the Lord, and because of these abominations the Lord your God drives them out from before you. 13 You shall be blameless before the Lord your God. 14 For these nations which you will dispossess listened to soothsayers and diviners; but as for you, the Lord your God has not appointed such for you. 17 “And the Lord said to me: ‘What they have spoken is good. 18 I will raise up for them a Prophet like you from among their brethren, and will put My words in His mouth, and He shall speak to them all that I command Him. 21 And if you say in your heart, ‘How shall we know the word which the Lord has not spoken?’— 22 when a prophet speaks in the name of the Lord, if the thing does not happen or come to pass, that is the thing which the Lord has not spoken; the prophet has spoken it presumptuously; you shall not be afraid of him. One should not be confused with ministering to the needs of a person vs presenting the full gospel.Its obvious if someone is in need of the next meal, feed him, dont just share John3:16 and say God bless you. The messenger is just as impt as the message. When the rich young man came to Jesus and ask how can he be saved , what did Jesus say ? Its a hard message but the truth. Jesus stress the cost of following him eg Luke 9:57… Its dangerous to belittle persecution as we have never seen it in our country. But dont be myopic, we only have 5 million people. Look outward. Why would Jesus say in amtthew that those who stand firm/persevere to the end will be saved if its a free lunch. I am not against prosperity and there is absolutely nothing wrong when God bless us. But have a balanced view of the scriptures.Shepherds must challenge the flock and certainly dont want anyone to end uo one day whenthey say Lord Lord and is told I dont know you. It’s obvious this guy is a “christian” as non believers will not call him Lord Lord. By grace we are save thru faith. But faith must be demostrated in/by works, as even the demons believe in Jesus. Why did jesus say why do you call me Lord and dont obey my commands. We must present the full gospel otherwise some maybe decieved. Those who dont know, dont know that that they know. If you are deceived, chances are pretty good that you dont know that you believe something untrue, ( half truth is not truth) –otherwise you wouldnt be decieved. (“you” is not referring to anyone on the blog). Cheers. I personally do not attend any church service/gathering now, and I can’t care less if any pastor is going to condemn me for not paying tithes. There are many good ministries that have gone online, without fancy buildings to upkeep. These people have also FB pages where they post their teaching videos and testimonies. Best of all, they are reachable for any queries and discussions. Gifts of the Spirit can also be exercised through the internet without meeting face to face, and they are also known to hold Skype and telephone prayer. I personally had prayer through email that was very effective. Besides, going to church on a Sunday just to hear the Bible being preached only goes to show that God is not speaking at other times. Either that or people don’t want to hear from God other than on a Sunday. There are believers in the US and Canada who have gone out to the streets and randomly exercising the Gifts of the Holy Spirit, just to demonstrate that God is with them at all times and not just on a Sunday morning in a service in a fancy building with a fancy worship team. So, do we still need beautiful buildings/mega churches? That is so passé!